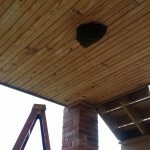 Bee Removal OKC - We Rehome Bee Swarms! 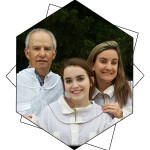 | Award-Winning Local Honey From OKC! 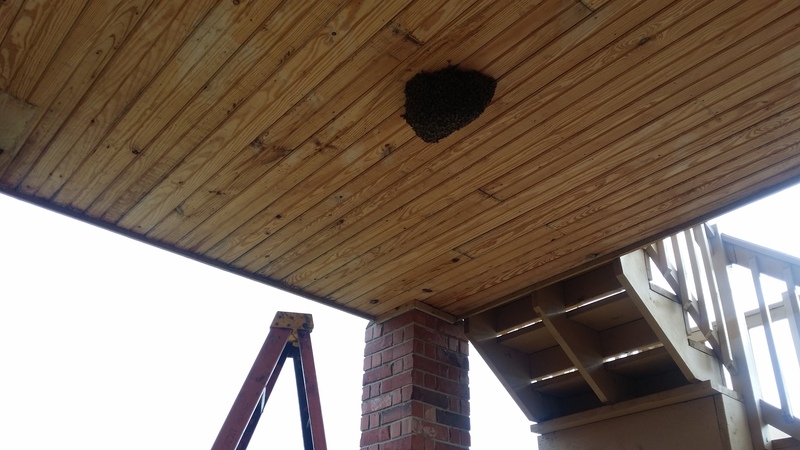 Bee Removal OKC – We Rehome Bee Swarms! Queen Bri’s Honey is happy to do bee removal for any bee swarms that you might find in the Oklahoma City and surrounding areas. Local bee swarms will be relocated to one of our bee apiaries where they will receive a brand new hive and food to supplement them until they can collect enough pollen and nectar to survive unassisted. 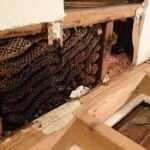 Some bee removals are close enough to us and easy enough to get that we can remove them for FREE. Other bee removals will require a charge to remove them if they are inside a structure or if you are a long way from our location. It really just depends, so give us a call, and we might be able to get them off your hands for FREE. Why do we charge for some bee removal services? Our time is very valuable, and it takes time to travel to bee removal sites and remove the bees, and time to set them up in their new hive box back at our apiary. It also costs gas money. Sometimes, the bees are very aggressive, and our beekeepers will be stung many times during the removal process. Bee removals are both a dangerous and physically demanding service. Some bee removals can take hours to complete, even as many as 12 hours if we are having to cut away walls and scrub them down after the bees are removed so that no traces of wax or honey are left behind. And, often this work has to be done 14 feet up in the air on a wobbly ladder. Bee removals are often requested during the hottest part of the year, so our beekeepers are in danger of heat exhaustion or heat stroke while they are suited up in their bee suits during the removal. Think of it as mowing your lawn in 100 degree weather wearing a winter sweater and sweatpants. Unfortunately, the value of the bees that we retrieve is very low because their health is unknown. They might be loaded with parasites or very sick, and we might have to buy expensive medication to treat them. Many times after honeybees are removed, the entire colony will re-swarm, so it is not guaranteed that they will even produce any honey. For those colonies that do stay, they will require approximately $100 worth of sugar and medication during the first year that they are establishing themselves in their new colony, and they will require beekeeping hive equipment worth $250 to put them into a new hive. So, the value of the bees is miniscule compared to the costs of giving the bees a new home, and the risk that we assume in spending money on new hive equipment for them, food, and medication for bees that might not even stay the whole season. How long has the hive been in its current location? What structure has the hive landed on? We might need to bring clippers or a saw to safely remove the hive from branches with thick leaves. Or if it is behind a wall, we might have to cut away the siding or sheet rock in order to get to them. We will need you to text us a picture of the swarm – both a picture far off that can give us some perspective to how high up it is located and how large the swarm is, and a picture zoomed in with your camera. Why do we need this? 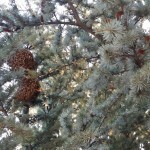 We receive many calls each year about “bees are in my bushes”, and after going to these locations, it is simply bees pollinating a bush/tree/hedge that has lots of small flowers on it. So, we have to make sure we are dealing with a swarm and not bees simply being bees! Also, sometimes the “swarm” ends up being a hornets nest or a swarm of yellow jackets, and these require an exterminator. How high up have the bees landed? 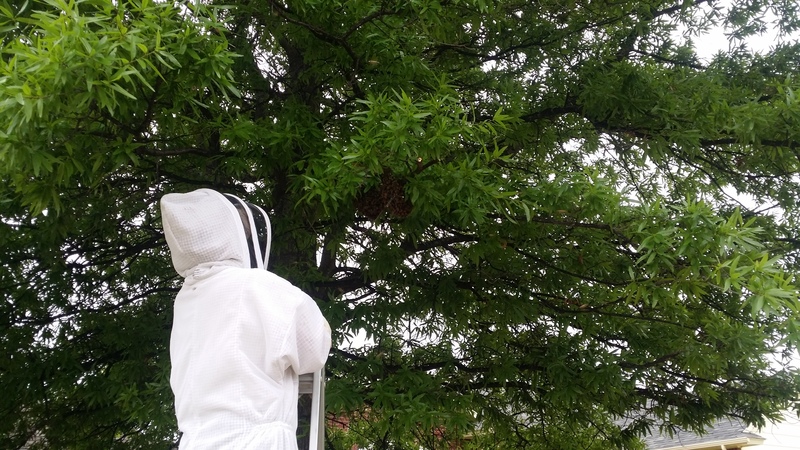 We can remove bees from structures which can be reached with a 12 foot step ladder; however, we don’t climb trees, roofs or other structures if the bees are higher than where we can reach them with a ladder. 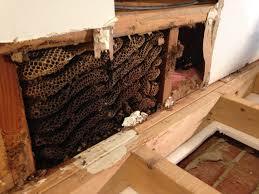 So, we do not do bee removals from chimneys, from the outside wall above the first story, etc. Any bees that have been sprayed with bug spray – so DO NOT ever spray the bees with bug spray if you would like for a beekeeper to come remove them to help save the bees. We would love to do bee removals for ALL swarm requests that come in, however, the safety of our beekeepers must be the top priority. 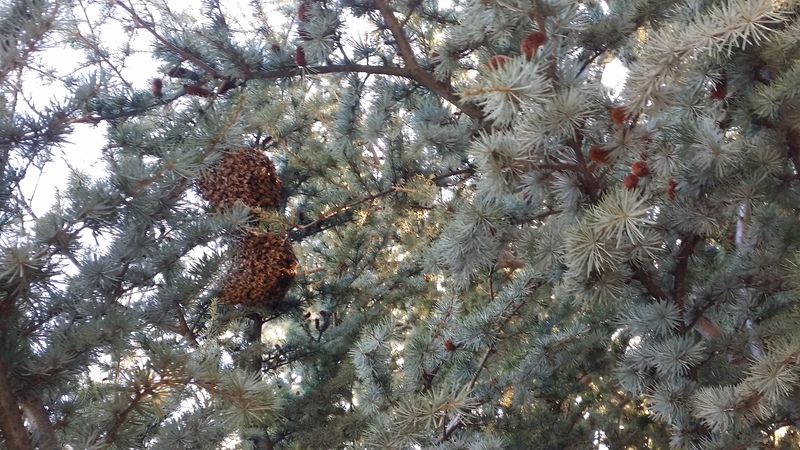 If our beekeepers cannot reach the swarm without endangering themselves, or without getting into a situation where other critters might be sleeping (such as skunks, snakes, etc. 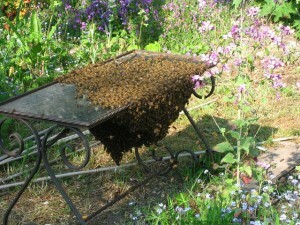 ), then the bees are better off being left alone until they move to a different location. How Long Do Bee Swarms Stay in One Place? – That’s a great question! 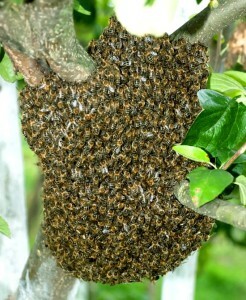 Sometimes bee swarms only stay put for just a few minutes, and sometimes they’ll stay put for several hours. The earlier in the day it is, the more likely they won’t stay long. They will tend to use their daylight hours to scope out a new location. 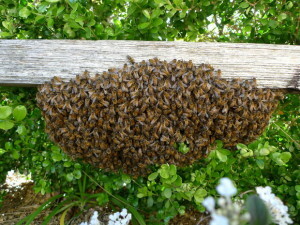 As it gets closer to late afternoon, the bee swarm will begin to look for someplace safe and dry to stay for the night. So, swarms noticed in the late afternoon won’t be as likely to change locations. – Another great question! Some bees swarm because their hive got too crowded, so the queen took half the hive with her to find a larger hive, leaving the remaining hive to requeen itself and continue growing. Other bees swarm because the queen is getting older and isn’t producing as many eggs daily as the worker bees would like, and the queen can sense that she is about to be replaced by another, younger, queen. When queen bees get replaced, the new queen or other workers will sting the old queen to death. I know! Not a pleasant way to go, is it? So, when an old queen senses that, she’ll swarm. 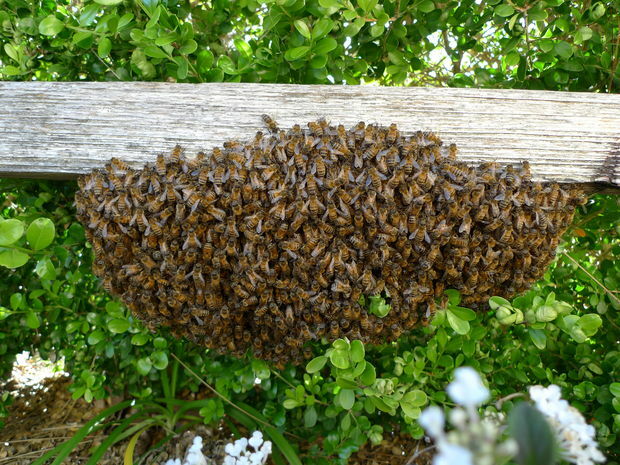 How Do You Know if a Bee Swarm is Dangerous? – You will know that you have a potentially dangerous situation on your hands if the bees are coming after anyone that is in the yard with them. If they are clustered up in a ball and not really flying around, leave them alone. They are probably just a hive of gentle, Italian bees looking for a new home. However; if the bees are coming after you, your family, pets, or livestock, it IS possible you have an Africanized bee swarm on your hands. 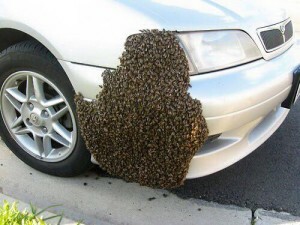 Please call a beekeeper immediately! Africanized bees are typically fumigated as we do not want these bees propagating in Oklahoma. 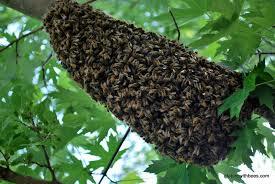 We do have Africanized bees in Oklahoma in small numbers, but they are not extremely common YET. They are dangerous and deadly. Currently, Africanized bees have not been spotted north of Ardmore or Ada because once they get much farther north, the climate is too cold for them in the winter. Africanized bees prefer hotter climates like in Texas, New Mexico, Florida, and Arizona, which is where the majority of African bees have been found.